Bringing together people of all ages together through dance, this participatory art installation features three amateur dancers from Mexico City, all in their late 60s and 70s, who will offer open demonstrations and free lessons in the traditional Mexican dance danzón to any willing passersby. Originally from Cuba, danzón is very popular in Mexico, especially in the main public plazas of Mexico City, Oaxaca, and Veracruz. In the 1990s, danzón had an important revival, becoming very popular among Mexico’s senior citizens. Seeking to recreate the sense of community, play and enjoyment found among these amateur mature dancers, Gallardo and her dancer collaborators will create a dynamic social environment featuring a purpose-built pavilion with dance floor, videos, audio, and site-specific drawings. This intergenerational participatory art project will be activated for one week by the dancers with a series of workshops June 28-July 3, after which time it will remain open to the general public with periodic workshops held by invited dancers through the summer and early fall. A Place to Live When We Are Old challenges some of our most entrenched preconceptions about growing old, in particular its association with mental and physical decline, illness, and lack of vitality. Working against the marginalization of senior citizens in contemporary society, Gallardo and her dancer collaborators have created a space in which to model and explore a different mode of living, one in which hope, community, play and intergenerational interconnectness can flourish. A Place to Live When We Are Old premiered at the Sao Paulo Biennial in 2010 and debuted in London in 2012 where it was supported by the Parasol Unit Foundation for Contemporary Art. 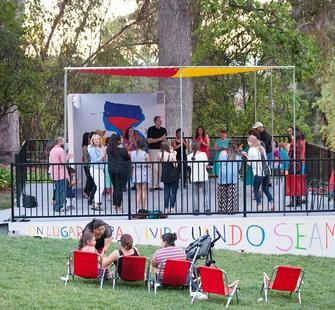 The work’s US debut is organized by the Lucas Artists Residency Program at Montalvo Arts Center. This project is generously supported by the Consulate General of Mexico, San Jose, AeroMexico, Bay Area Canvas and Awning, and Brandon Pfarr.